The Olympia organisation developed from the Union Typewriter Company, established by AEG in Berlin in 1903. After the 1914-18 war, typewriter production moved to a new factory in Erfurt in the east of Germany. The name "Olympia" was adopted as a trade mark for the 1930 model, which was so successful that the company was renamed "Olympia" in 1936. At the end of the 1939-45 war, production of the Olympia typewriter was re-established at Erfurt (now in the Soviet zone), and also at a new factory at Wilhelmshaven in West Germany. The rights to the name were not settled until 1950, when the Erfurt factory changed its name to "Optima". The Wilhelmshaven concern became Olympia Werke GmbH in 1950, and Olympia Werke AG in 1954. Olympia produced adding machines as well as typewriters at Wilhelmshaven from the late 1940s. The company expanded rapidly, absorbing the Alpina typewriter company and the Brunsviga calculator company during the 1960s, and then venturing into electronics and computers. Olympia reached its peak in around 1970, but collapsed shortly afterwards as Japanese calculators and computer-based word processors put an end to its traditional office machine markets. 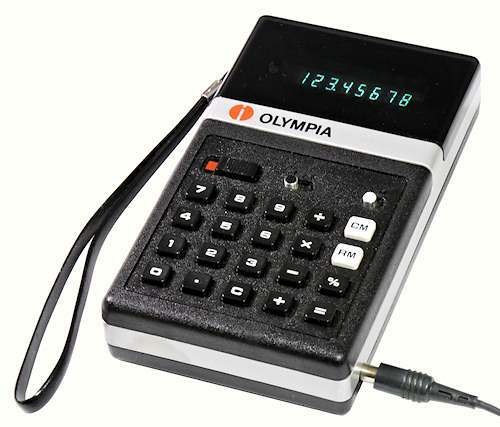 This page shows some typical Olympia calculators from the 1950s, 60s, and 70s. Click on the photos for larger illustrations. 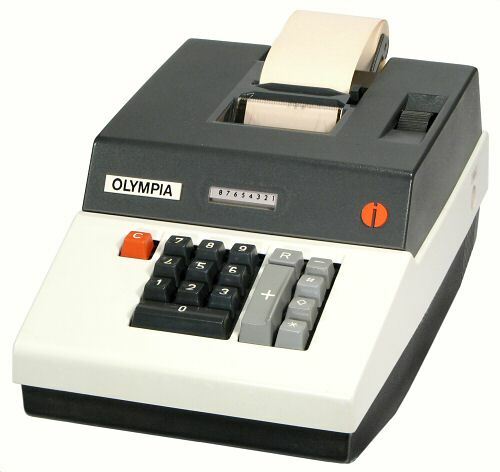 The Olympia RA-20 is a full-function ten-key calculator with an external travelling carriage. The mechanism is a development of a calculator design that first appeared in the late 1950s (US patents 3116873 and 4, filed by Ernst Trümpelmann et al in 1958). The mechanism is based on a pinbox and reciprocating racks, with rotary-gear registers for multiplier and constant storage. The accumulator and counter registers are mounted in the travelling carriage, with a rotary carry mechanism in the body of the machine. Subtraction is accomplished with a second set of reversing star wheels in the carriage. Technology: Pin-box / rack & pinion, manual. Olympia Model 1182 is a basic 8/9-column adding and listing machine from the early 1950s. The mechanism is quite well-made, with a metal base, a one-piece pressed-metal cover, and chrome trimmings. There are function keys for Non-add, Subtract, Total, Sub-total, and Repeat, and a manual clear-entry lever at the left of the keypad. 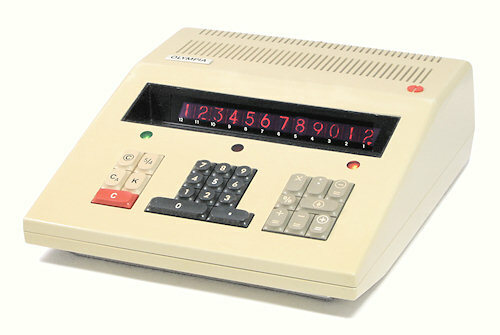 A version of this machine was re-sold by Monroe in America to complement their line of non-printing rotary calculators. The Monroe 811 incorporates three additional drive gears to re-position the operating handle nearer to the centre of the machine, but is otherwise identical to the Olympia 1182. Technology: Pin-box / rack & pinion, electric. 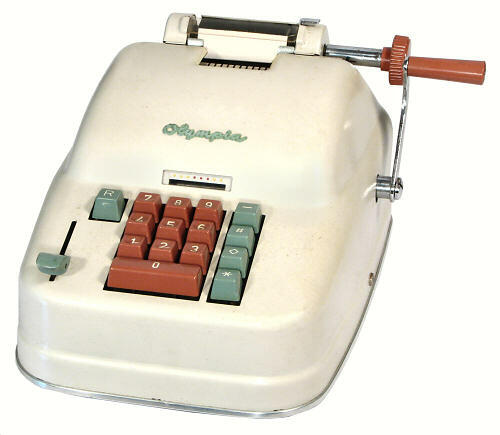 Olympia Model AM is a typical low-cost office add-list machine from the 1960s. The 8/9-column mechanism consists largely of plastic and die-cast components, housed in a light plastic case and powered by a small AC induction motor. The functions are the same as in the model above, but with a powered clearing key. Technology: Pin-box / rack & pinion, electric, automatic multiplication. 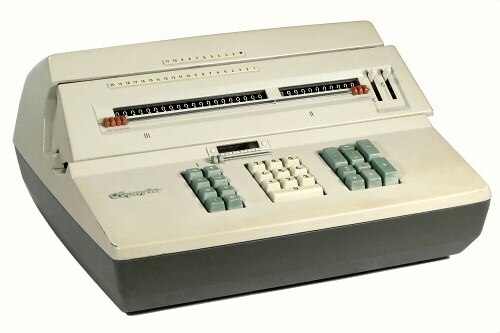 The Olympia RAS-12 is substantial late-model machine with fully-automatic multiplication. 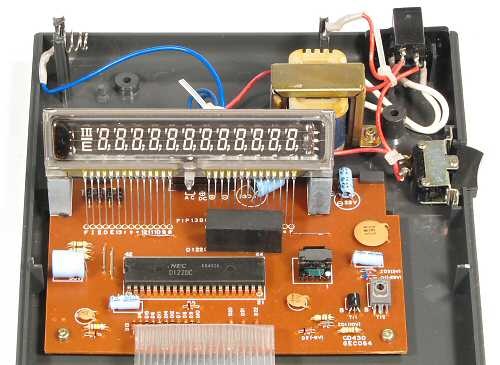 It has 11 places in the setting mechanism and 12 in the accumulator and printer, and is powered by a large capacitor-run motor located at the front of the keyboard. The machine operates at about 210 cycles per minute. Addition and subtraction operate in adding-machine fashion, with the usual total and sub-total keys. Multiplications are entered algebraically, using the "X" and "=" keys. The "X" key transfers the keyboard entry to a set of auxilliary racks in the base of the machine, which then control the sequence of operations when the "=" key is pressed. There is a separate "-=" key for negative multiplication (ie, to subtract a product from an existing total). The results of any calculation are returned to the multiplier racks and are available for re-use, without needing a separate back-transfer operation. The machine illustrated is dated September 1970, which was well into the electronic era. Manufactured: Made in Japan for Olympia, late 1971. 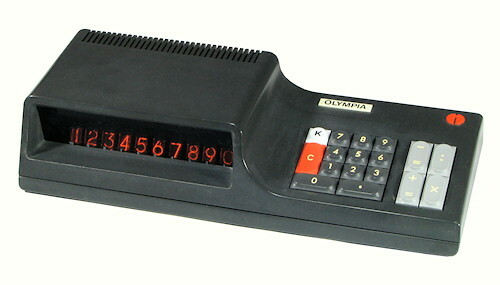 The Olympia CD-71 from 1974 is an 8-digit portable calculator with an internal Nicad battery pack. Calculators fitted with these "permanent" rechargeable batteries were generally at the expensive end of the market. The CD-71 has a suitably elegant design, and is very nicely built. Add and subtract operate in adding-machine fashion, while multiply and divide operate algebraically. A slider switch selects 2 or 4 decimal places with automatic 5/4 roundoff, or floating point mode without roundoff. The calculator has a percent key and an automatic constant function, both of which which operate normally. The memory accumulates the results of a series of multiplications and divisions when enabled by the "M" switch, but there is no "M+" key for direct memory access. 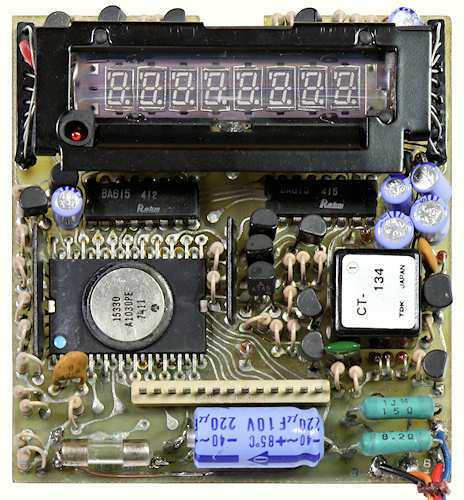 The circuitry uses a single Rockwell 15530 processor, with two Rohm BA615 chips to drive the fluorescent display tube. The double-ended tube has 8-segment numerals, with decimal points and thousands separators, and is mounted in a rubber and metal frame. The eighth segments are not used, and the thousands separators are only used for overflow indication. A single undiffused red LED (another expensive item in 1974) is used for the negative indicator. The circuit board carries a Matsushita (later Panasonic) logo. The internal battery pack contains four AA NiCad cells, which are recharged from an external adaptor type NLG80S. Power consumption varies from 40 to 75mA (450mW max), depending on the display. The CP-1210 is an electronic printing calculator which replicates the controls and functions of Olympia's mechanical adding and listing machines. 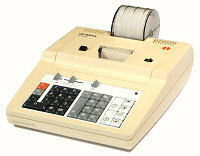 The calculator has no visible numeric display, but prints all entries and results on an internal 15-column line printer. Addition and subtraction operate in adding-machine fashion, with Add, Subtract, Total, and Sub-Total keys. Multiplication and division operate algebraically with a single Equals key. 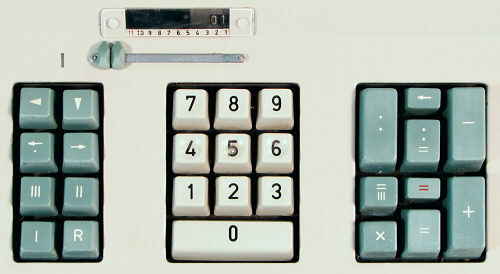 The four memory keys at the far right are also labelled in adding-machine fashion, with separate +/= and -/= keys for accumulation of products or quotients. A Non-Add key allows for printing of dates or batch numbers on the tape. Three slider switches select 5/4 roundoff, automatic accumulation, and number of decimal places (0 to 6, or floating-point mode). 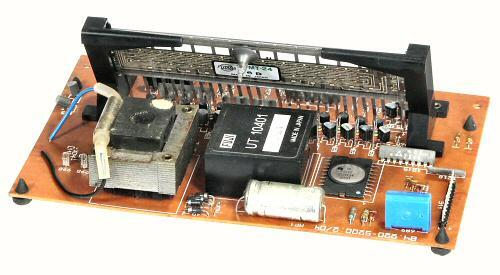 The circuitry of the CP-1210 uses a single Rockwell A4211CA processor chip, with two ULN2002A transistor arrays to drive the printer. There are no electronics in the printer itself - all of the timing and control is done by the main processor. The keyboard uses mechanical switch modules in which a gold-flashed coil spring rolls or slides across a circuit board to bridge adjacent contacts. 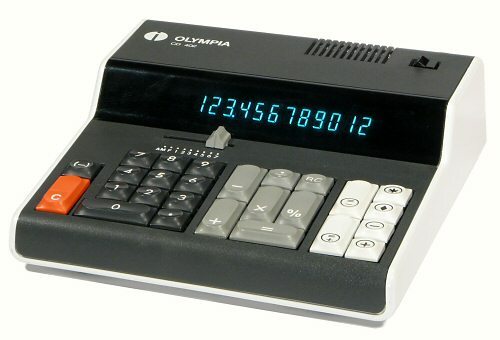 The Olympia CD-402 is a compact non-printing desk calculator with percent and memory functions. Addition and subtraction operate in the (now) usual manner with the display showing the accumulating total. Multiplication and division operate algebraically with a single Equals key. The memory register is still labelled in adding-machine fashion with add, subtract, sub-total and total keys. There are separate +/= and -/= keys for accumulation of products or quotients. A slider switch selects 0 to 7 fixed decimal places, floating decimals, or adding machine mode (with an assumed decimal point). The machine illustrated was built in 1976, but appears to be of European rather than Japanese manufacture. 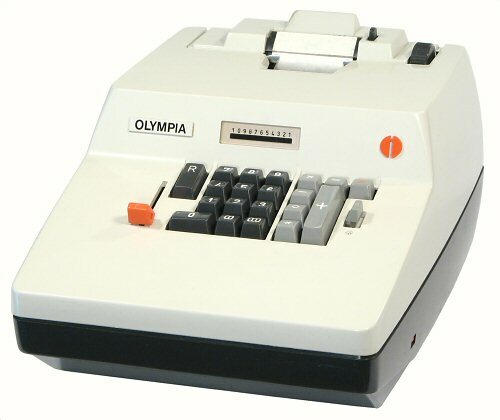 The styling and keyboard layout are consistent with Olympia's earlier mechanical calculators, with the additional memory keys colour-coded and grouped together at the right-hand side. The keyboard uses the same sliding-spring switch modules as the CP-1210 above. The circuitry uses an American Rockwell 15350 processor, but with a Japanese Futaba display panel and a Fuji power supply module. The display is driven by 34 discrete transistors from the European (BC) series. 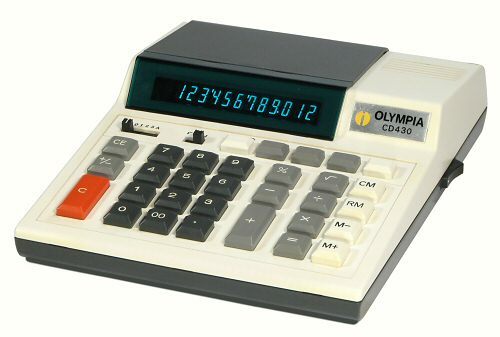 The Olympia CD-430 is a typical 1980s office calculator with square root, percentage, and mark-up functions. The operation of the machine is entirely conventional - even the memory functions use the now-standard M+/M-/RM/CM keys instead of the circles and adding-machine symbols. The Japanese manufacturer is not identified, but the D1220C processor and the fluorescent display module are both from NEC. The calculator can be powered from the AC mains, or from two C-size dry batteries for portable use. The battery load is about 600mW. There seems to be very little information in English on the history of the Olympia company. The Overview above is adapted from the entries for Olympia and Optima on the German Wikipedia site.